This continues the discussion of 16 January 2018, which adds the objective analysis of the 500 mb height contours for two additional observational periods, 0000 GMT and 1200 GMT, 17 January 2018. Fig. 1 Depiction of the height field of the 500 mb pressure surface in tens of meter for 0000 Greenwich mean time, 17 January 2018. Fig. 2 Depiction of the height field of the 500 mb pressure surface in tens of meter for 1200 Greenwich mean time, 17 January 2018. The maps presented in the previous discussion and those presented here (Figs. 1 and 2) show the progress of the Arctic airmass southward out of Canada and eastward to the United States Eastern Seaboard. The resulting cold experience for people caught in this cold outbreak is mapped out as a wind chill index map, which depicts the cold discomfort as affected by the the temperature and the strength of the surface wind. The frigid outbreak brought rare accumulations of snow to the South. 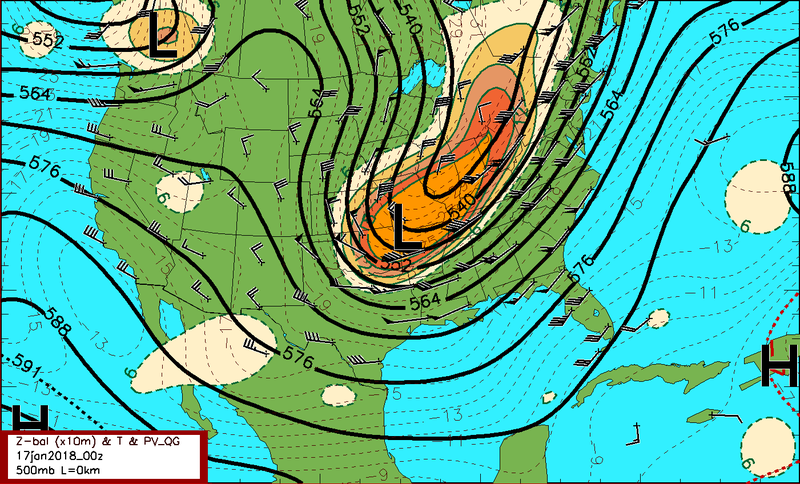 Vorticity is a property of the atmosphere that is of interest in weather applications. The fluid elements of the atmosphere are spinning at different rates, which vary in both space and time. 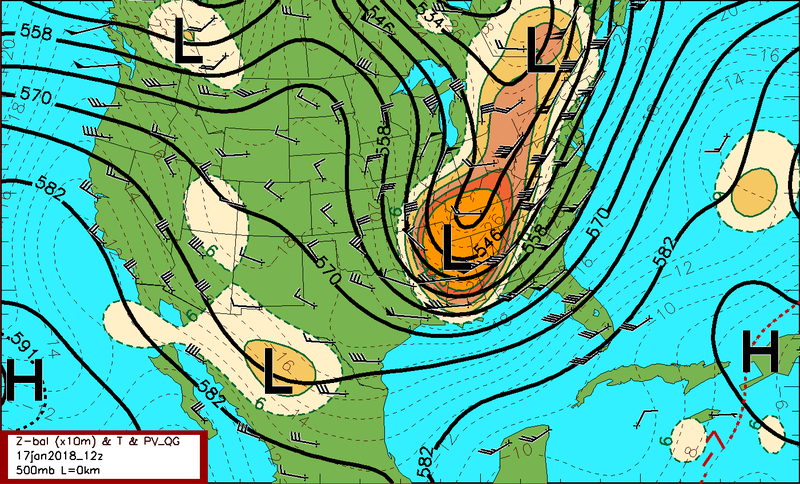 Vorticity is a vector that points locally along the fluid spin axis at every point in a right hand sense. Vorticity applied to atmospheric motions focuses on the vertical component of vorticity, because the atmosphere is horizontally stratified. This specialization can be justified in terms of the scales atmospheric motion. Large scale patterns of atmospheric motion involve a very small scale of vertical motion compared to that of horizontal motions, although both vertical and horizontal motions are coupled dynamically. On a large horizontal scale (on the order of 1,000 km) the motion of the atmosphere is almost horizontal, but this horizontal flow is dynamically coupled to a much smaller scale vertical circulation. At higher levels in the atmosphere winds blow on a scale of tens of meters per second, whereas the vertical motions tied to these are on a scale of centimeters per second. This is the scale often depicted on national weather maps and referred to by meteorologists as the synoptic scale. Despite the miniscule scale, the vertical part of large-scale atmospheric circulations produce the important weather changes. Rising motion is associated with cooling and increasing cloudiness. Sinking motion is associated with clearing, drying and warming. Predicting the patterns of rising and sinking motion therefore becomes an important part of weather forecasting. Unfortunately, because of its very small vertical scale and distributed on a very wide horizontal scale, this component of vertical motion is very difficult to measure directly. An important process that allows one to infer the large-scale patterns of ascending and descending motion in the atmosphere is the notion that on a large-scale its pressure and circulation are in some kind of approximate balance, called geostrophic balance. This geostrophic balance shows up in the analyses of Figs. 1 and 2, where the observed winds, depicted in meteorological notation, blow parallel to the pressure height contours. Geostropic balance, however, is only approximate, and the motions associated with geostropically balanced fields tend to throw the such fields out of that balance in a short time. Even though geostrophically balanced circulations tend to fall out of balance as a result of their very circulation, the atmosphere is observed to remain in approximate geostrophic balance almost all of the time. In the QG approximation, the vertical component of motion is taken as part of a small secondary circulation that acts at every moment to keep the atmosphere in geostrophic balance. The large-scale, vertical motion field is therefore seen as part of a parasitic (or ageostrophic) circulation that is driven by its own geostrophic circulations, but acts to restore geostrophic balance at every moment. Computationally, this means that the vertical motion associated with three dimensionally analyzed fields can be diagnosed through a set of algorithms and is valid at that analysis time. A dynamically important quantity that appears in QG Theory is quasi-geostropic potential vorticity (QG-PV). Unlike vorticity which can be spun up or spun down through a number of mechanisms, QG-PV is approximately conserved, which means that QG-PV ties together analyses made at successive times based on sets of observations independent of each other. The color-filled contour field included in the in the 500 mb analyses depicted above (Fig.1 and 2) and in the earlier post exhibit a corresponding QG-PV analysis. Looking at the QG-PV distribution at the various times over the last twenty four hours reveals the conserved nature of this field, despite a few minor flickers in the field owing to the limited resolution of horizontal coverage by the sound network.